Staff Sgt. James Dozier, Tacoma Mall Center recruiter, stirs a pot of carrots at the Rescue Mission’s Adams Street Campus Dec. 31. Dozier was one of several recruiters helping to feed families staying at the mission. Capt. 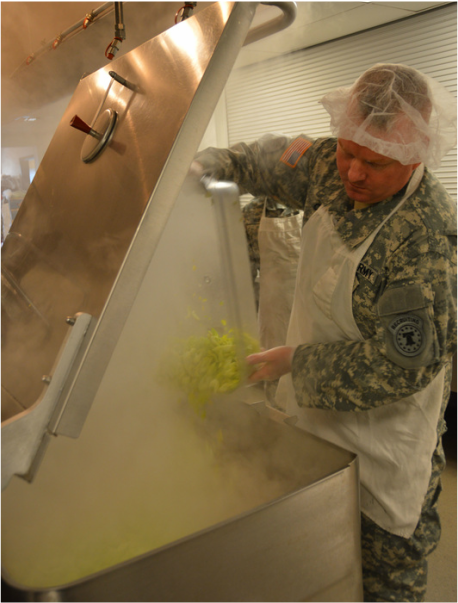 Henrik Chase, Tacoma company commander, pours celery into a vat of chicken at the Rescue Mission’s Adams Street Campus Dec. 31. Chase joined several recruiters from Tacoma Mall Center who devoted part of their day to giving back to the community. Sgt. 1st Class Jesse Santos and Sgt. Maurice Jones from the Tacoma Mall Center pour rice into a container at the Rescue Mission’s Adams Street Campus Dec. 31. This is the second time these recruiters have helped cook and serve food for mission patrons. The cooker opens and steam discharges, filling the air with the smell of chicken broth. Spoons clang against pots full of chopped carrots, a knife slices vegetables on a cutting board, and the murmur of kitchen staff chatting can be heard as cooks prepare lunch at the Rescue Mission in Tacoma, Washington. The staff today, includes Seattle Battalion recruiters from the Tacoma Mall Center who started volunteering at the mission in November. They take a few hours out of a day once a month to help cook, clean, and serve lunch. The mission’s Adams Street Campus offers shelter and food for families and single women in the Tacoma area. 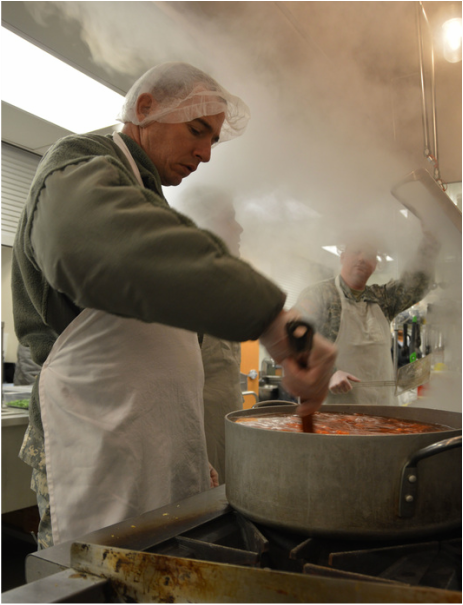 The recruiters served the mission’s patrons before Thanksgiving and after Christmas. Capt. Henrik Chase, Tacoma company commander, joined his NCOs in December.